I’ve left it quite late this month but it still counts! 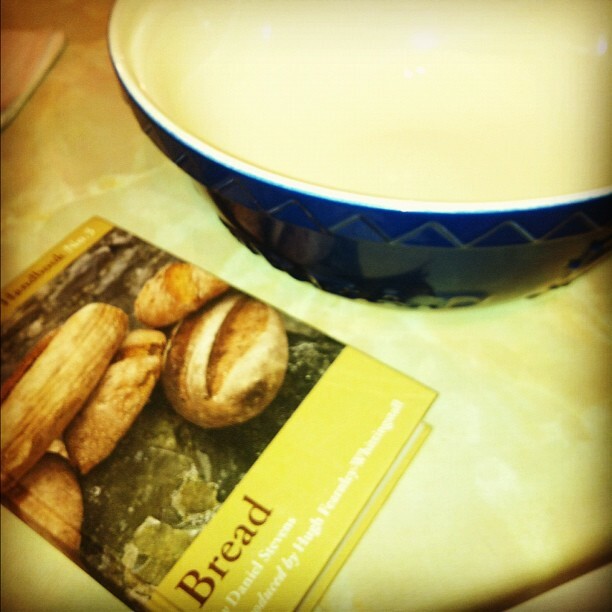 I went and bought myself a book, a bread book: River Cottage Handbook No.3 – Bread. It’s nice and compact, has a lovely section on making bread and taking care of your bread and still has loads of recipes. After making a pretty simple granary loaf last month, I decided to mix it up a little but still remained pretty unadventurous. I’d like to perfect my bread-making technique before I try anything too outrageous (if you can describe bread as outrageous). I decided upon a simple recipe in my new book, Festival Bread. A celebration of the inaugural River Cottage Festival, we thought we’d have a bit of fun. So, from a choice of five or six different flours and a couple of dozen other ingredients, around sixty guests, my co-host Steven and I came up with this unlikely recipe – through nominating, voting and a little cajoling. The alfalfa seeds got in on novelty rather than merit. 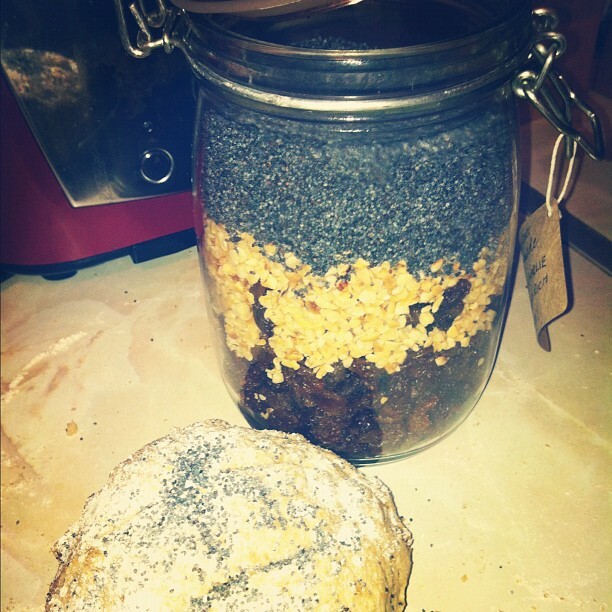 Steven was the only voice in favour of poppy seeds, so we put some in.. to keep him happy. I won’t lie, I chose this recipe mostly because it included cider, one of my guilty pleasures but it turned out great! I followed the classic bread making method, used in my new bread book, that calls for less raising and kneading time for the dough than the previous method I used. I think that the combination of this and ingredients, such as cider and honey meant that the bread was very moist and rather dense. On reflection, I think I’d have added less liquid and left the bread to rise for a longer period of time, just to compare the results. Despite this, my boyfriend assures me it was very tasty and especially nice warm. It almost tastes a little bit like a dough-ier fruit cake. The texture of the bread is thick rather than airy and light but I think this is due to the ingredients rather than the bread-making method. One thing I am particularly happy with is the crust which is perfectly browned and crusty. I think this is a result of me turning the oven right up to the hottest setting for the first ten minutes of baking and splashing the bread with boiling water, it seems to have worked. I added a sprinkle of poppy seeds straight before baking which has given it a really nice look. They have seeped into the textured cuts in the top. Let me know if you try this recipe, I’d love to find out how yours turned out and if the texture is down to method or recipe.